Ask fellow campers about "Crazy Horse Recreational Park" and nearby attractions. 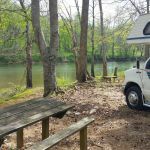 Crazy Horse RV Park & Canoe Rental is located on the Buffalo River in very rural Waynesboro, TN with a first come, first serve policy. Gravel entry road is a bit rough. There are two sides to the RV Park. The north side of the bridge is the "family" side where quiet time is 10pm to 8am. 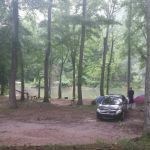 It is a huge field with over ½ mile of waterfront camping: primitive and 30-amp hook-up sites available; however, at this time (4/2017) there was no WIFI on that side of the bridge. The owner says they plan to extend the WIFI in the near future. There are rest rooms and a dump station on the north side. The sites are grassy and appear level from a distance. It's basically a wide open field so motor coaches and longer rigs should have no problem navigating since there are no obstructions. The south side of the bridge is the not-so-quiet side of the campground where the canoe rental is located. Quiet time on this side is midnight - 8am. There are very nice, free showers & restrooms available behind the convenience store. WIFI is available up close to the convenience store but CELL service was weak - we have Verizon. Sites are natural ground but leveling our 26' Class C was easy. There was room to park a vehicle next to our RV within our site. Larger rigs may have trouble maneuvering these sites as there are quite a few trees and roots, burn rings and picnic tables. This side has a stage for summer concerts. Their on-site convenience store offers camping, fishing, and canoe rentals and supplies... and ice! There's also a general store across the river. The nearest grocery store (Piggly Wiggly), drugstore (Fred's) or gas stations (Marathon and Exxon) and restaurants are approximately 13 miles away. There was a restaurant a few miles from the campground but whenever we passed it, it didn't seem open. We stayed here from 4/9-4/13 and pretty much had the entire campground to ourselves with the exception of one tent camper. It was very peaceful. The owner was extremely nice and accommodating. The river is quite lovely. We camped at Crazy Horse Recreational Park in a Motorhome. Are you affiliated with Crazy Horse Recreational Park ?